Barr An Bhaile in Caherdaniel, Co Kerry sleeps 8 people. 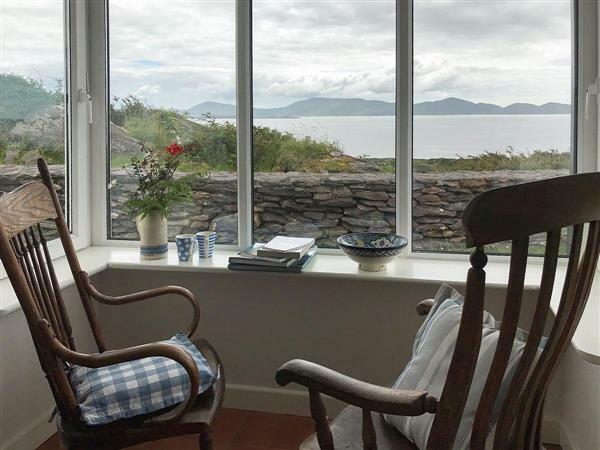 Offering stunning panoramic views of Kenmare Bay, the Beara Peninsula and rocky coves, this traditional detached cottage is the perfect getaway retreat for those looking for a peaceful and relaxing holiday. Accessed via a steep lane, the property is located 1½ miles from Caherdaniel and within a 10 minute walk to a small sandy beach. Plenty of activities to enjoy in the surrounding area including, horse riding and scenic walking routes. Shop 1½ miles. Step to ground floor: Living room with cathedral ceiling and wooden floor. 3 steps up to dining room/kitchen with ceramic-tiled floor. Utility room. 2 bedrooms: 1 double with en-suite shower room and toilet, 1 twin. Bathroom with shower over bath and toilet. Two separate open-tread staircases to first floor: 2 galleried bedrooms: 1 double (5ft) with Velux window, 1 twin. All bedrooms with wooden floors. Woodburner in living room. Oil central heating and electric by meter reading. Bed linen and towels included. Travel cot. High-chair. Video. DVD. CD. Microwave. Washing machine. Tumble dryer. Dish washer. Fridge/Freezer. Small garden with patio and furniture. Barbeque. Parking. Holidays at Barr An Bhaile run from Saturday to Saturday. For a better idea of where Barr An Bhaile is, you can see Barr An Bhaile on the map below. Do you want to holiday near Barr An Bhaile (YYH), you can see other cottages within 25 miles of Barr An Bhaile; have a look to find your perfect holiday location.